The Blinded Sphinx moth takes its name from prominent blue eye spots on each of its bright pink hind wings. When at rest, its hind wings and eye spots cannot be seen, hence the name. These beautiful moths are nocturnal creatures and seldom seen by day. 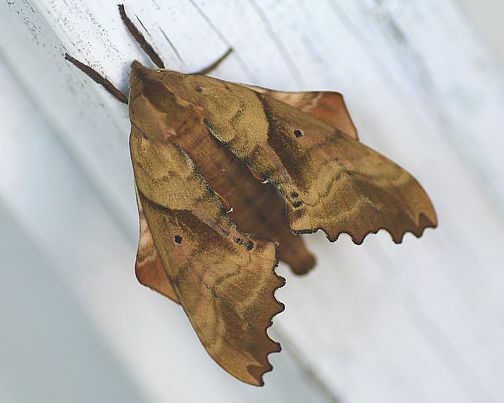 Like other adult members of the giant silk moth clan such as the Atlas, Cecropia, Luna, Polyphemus and Promethea moths, they lack mouth parts, and so they cannot feed. Unable to take in nourishment, they live for only a handful of days after emerging from their chrysalises, just long enough to find a mate and perpetuate their genetic material. It is sad to think that something so exquisite inhabits the earth for such a short time. My sphinx perched on the door of the little blue house in the village this weekend. As it appeared in full daylight, I can only assume it was nearing the end of its brief but utterly sublime existence. Starting this paragraph, I wrote "My specimen perched..." then thought a creature so magnificent should be called by its proper name and not simply as a specimen, especially near the end of its allotted days. I addressed it as "sphinx" and thanked it for visiting me at a time when I desperately needed to see such a wonder. Ah, but it lived before it became a moth, remember. And besides, time is relative. Beautiful moth, beautifully photographed.